JOHN DINSDALE autograph letter with drawing. ALS. (signed with initials) 1p. 32 Torriano Avenue, N.W. To [William] Woodall. 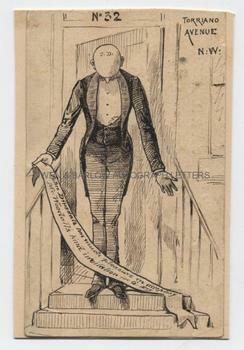 The letter is in the form of a banner held in the hand of a self-portrait of John Dinsdale, standing on the steps of his house and bowing his head. It reads "John Dinsdale has much pleasure in accepting Mr Woodall's kind invitation for 6th May." Signed with tiny initials on the pate of his bald head! On paper measuring approx 4.75 x 3 inches laid down on card from an album leaf with part of an unrelated photograph on verso. Fine. John Dinsdale was an artist and illustrator who was most active in the 1880s. He contributed illustrations to the Illustrated London News, the Graphic, Punch and other periodicals and was particularly known for his illustrations in the Girls Own Paper and for his leading contribution to the Victorian periodical 'Fun', a competitor to Punch. He published a series of books with his own illustrations, including 'Sketches of Whitby', 'Sketches of London', 'Theatrical Sketches', etc. A Victorian artist whose work is now fairly obscure but a fine and well executed drawing with a humorous subject.